The house was probably built before 1730, since the Rev Samuel Duffield inherited it initially from his father, a solicitor, into whose possession it had come. Samuel Duffield’s will dated 1731 set out his intention, should his infant son not survive, of setting up two charity schools for orphaned children, one in Sherburn (which was always in a rented property), the other in Cawood. This house belonged to the charity, along with other properties and a parcel of farm land with no farmhouse – could a farmer have decided to build himself a house in the village and then gone bankrupt, which is how it ended up with the Duffields? The house was probably built as a farmhouse, as it has a stone floor in the attic (see below). 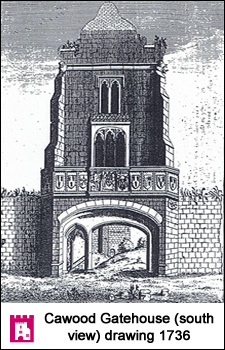 When the house was built, Cawood Castle (along with several others) had been demolished on instructions of Parliament (during Cromwell’s Protectorate). Although the instructions for demolition were given in 1646, it may have taken some time to carry this out, since John Evelyn in his diary notes that in 1654 when he arrived there, they were still demolishing Pontefract Castle. 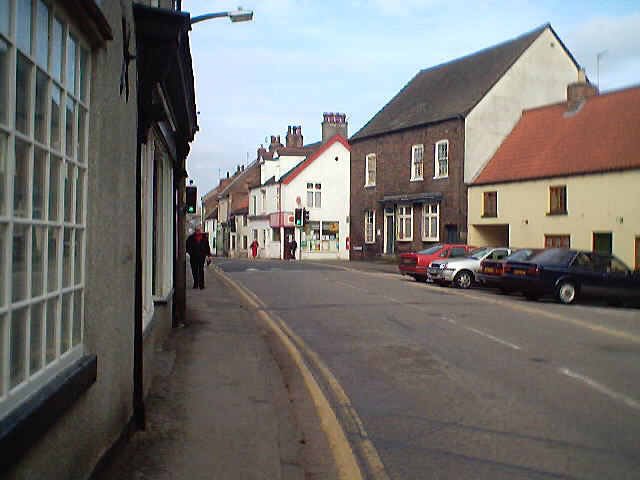 He also writes that, near Tadcaster, he could see the Archbishop’s Palace (“We rode to Tadcaster, at the side of which we have prospect of the Archbishop’s Palace (which is a noble seate)”). 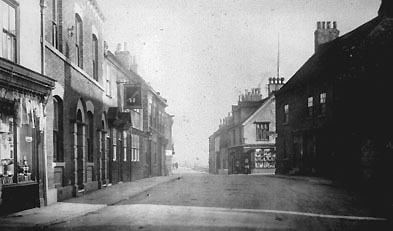 Was this Cawood or Bishopthorpe? The cellar of Bank House contains stones from the Castle, and was built with a “drain” connecting it with the dyke, so that if the dyke flooded and the cellars were filled with water, the water would drain away again. That drain was plugged by a previous occupant in the 20th Century – there shouldn’t be any flooding any more anyway since the dyke was culverted, unless it overtops. Part of the cellar has also been filled in at some point, so that only one “room” is available to use. The oak used in the construction of the building came from shipwrecks (all oak at that time was otherwise exclusively for use by the navy – only oak from shipwrecks could be used for building houses). Some curved spars are evident in the attic, also some of the old timbers held together with wooden pegs. The attic has a “stone” floor – a type of cement laid on the laths and straw of the ceiling below. This was in order to store grain (rather than the cellars, since this is a flood prone area! – this type of attic is common locally in old buildings). There were two windows in the attic, either gable end – one (overlooking the butcher’s next door) was blocked up before 1988. Since there was originally another building where Thorpe Lane now runs (so that instead of a crossroad, this was a T junction until about 1887), in order to give access to the rear (“tradesmen’s entrance”) – there was a passage through the house at the side. To accommodate this, the chimney goes up in two 45° angles, and there is a brick arch built to take the weight of the chimney. A previous owner knocked a hole through the ceiling and put glorified ladders through to give access to the attic this way, and closed off the original stairs which went up to the attic from the house. The current stairs have a Spanish style metal bannisters, as the previous owner was a metal-work teacher. The chimneys were also taken down, one has since been restored although not in the style of the originals. The house has seen many changes since it was built. For instance, the bow windows at the front are a much later addition – the original windows were smaller, and the original front door will have been between them, leading to another two doors, making a passageway through the house. The other two doorways are still there. Various chimneys, fireplaces and servants’ stairs have been removed, although there is still a stairwell where the stairs from the front bedroom went to the attic. The main attic stairs have gone, and the back door is not in its original position. The arched window at the back is probably a later addition, put in when the attic stairs were removed. The dyke ran along the back of the outside yard until it was culverted in the 1970s. Old maps show little bridges over the dyke, and there is a report of the girls having crossed over to the waste ground beyond in order to take exercise. At the time of the culverting, all the adjoining properties added that land onto their gardens. The original outbuildings would have drained into the dyke. When we moved in, there were still people who remembered walking along the unculverted dyke as children, taking care to avoid outflows from the houses all along the dyke. (Old photos from Michael Bell). The back wall of the garden has stones from the original Castle wall, with a brick wall above – this section of the garden is considerably lower than the street level. On the street-side wall, there is still evidence of a brick archway where this was a bridge over the dyke before it was culverted. In the garden, there are black layers in the soil, also a large metal item was dug up – possibly evidence of the various sieges of Cawood Castle undertaken in the Civil War. (From the 1829 report) “The Rev Samuel Duffield, by Will dated 24th June 1731, devised all his messuages, lands and hereditaments in the several parishes of Sherburn, Cawood and Barwick in Elmet, in the West Riding of York, to Bacon Morritt, of the City of York, Esq, and another trustee, in trust for the use of his son, Francis Duffield for life, and his issues afterwards, as therein mentioned, and on failure of issue, he devised the same, together with all his personal estate … for the erecting and founding a charity school for girls at Sherburn … and at Cawood … for founding a school for boys or girls, and the maintenance and clothing of them at Cawood … the said Bacon Morritt … directed that his own relations children, being poor, should be preferred in all appointments to the said schools, and that the children of Sherburn and Cawood should be first elected to fill the schools, and afterwards others from Potterton, then from Milford, Barkston, and all the parish of Sherburn. The Sherburn School, which he visited in 1858, was under another Caroline Lewis, appointed about the year 1822, who was a grand-daughter of the founder, and the stepmother of the Cawood mistress. She received 87l a year, for which she clothed, fed and instructed five girls, chiefly orphans, children of labouring people, and appointed by the trustees. They entered the school at 8, and after an education similar to that at Cawood, left at 16 to go into service. In both schools religious instruction was in accordance with the doctrine of the Church of England, the girls at Cawood attending the Church Sunday School, and those at Sherburn attending the Church twice on Sundays with the mistress. At this period, partly on account of the supposed unhealthiness of Cawood School, the trustees were desirous of amalgamating the two schools, and in 1862 Mr Martin reported in favour of a joint school at Sherburn. From the Report of the Schools Inquiry Commission (vol xviii, 384 and 404) it appears that the condition of the schools in 1867 was unaltered, except that there were only five girls at Cawood. Mr Fearon in 1871 found the Cawood School under the management of Mrs Mary Emmett, appointed 10th July 1865, who, with an assistant, Eleanor Emmett, taught five foundation scholars, of whom three were orphans, and about 20 other girls, two of whom were weekly boarders and the rest day scholars, who paid fees of 4d to 6d a week. …“In 1873 Mrs Lewis retired with a pension of 20l under an Order of the Charity Commissioners, dated 30th May In 1873 the Sherburn School was closed and the foundationers were transferred to the Cawood School; and in 1881 Mr Fearon reported that there were seven poor girls in the school, of whom three belonged to Cawood, and had at the date of their admission been provided with two new suits of clothes by the guardians of the poor; the others belonged to Sherburn. 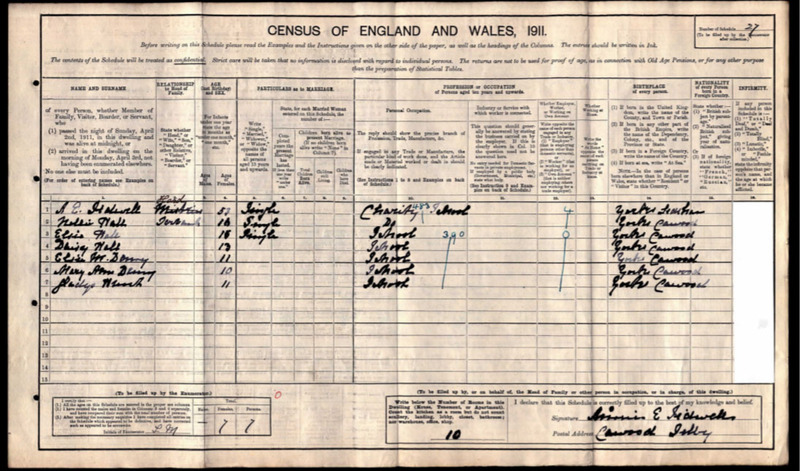 … “The schoolmistress or matron, Miss A E Sidwell, was appointed in 1888 at an annual salary of 40l, besides the use of the house free of rent, rates and taxes. She is not a certificated teacher. There are now seven girls in the school, four of whom belong to Cawood and three to Sherburn. One who had left shortly before the inquiry belonged to Potterton. There was as many as 11 girls at one period in 1896. A preference is given to orphans, including in this term girls who have lost one parent, unless a case of abject poverty presents itself. They are appointed by the trustees, to whom applications are submitted through the schoolmistress in Cawood and the vicar in Sherburn. There is not much demand, and the trustees never have to reject applicants. The girls enter at the age of seven or later, provided with an outfit supplied by their parents or guardians, and leave the school when they are in their sixteenth year. During this period, they are lodged, fed, and clothed by the schoolmistress, who receives 20l a year for each girl from the trustees. Bedding and furniture, however, are provided by the trustees. The clothing supplied is a simple uniform consisting of a dark blue serge dress and a white cap and kerchief. The girls are clean and neat and appeared to be healthy and cheerful. The school is not a Public Elementary School, but the instruction is on the same lines as in the lower standards under the Code, including freehand drawing and singing by ear. In addition to reading, writing and arithmetic, special attention is paid to cooking, sewing, washing, and all branches of a housemaid’s work, the destination of the girls being domestic service; and the appearance of the rooms and premises generally testifies to the efficiency of the latter branches of instruction. Miss Sidwell provides a servant at her own expense, generally one of the girls who has just left, who assists in the domestic instruction. The girls attend regularly at the church and the Sunday School. There are examinations by the trustees on the occasion of their half-yearly visits. G D Wallace, Assistant Commissioner, 20 October 1897. When I had a website with a page on the Bank House history, this included a copy of the 1871 census record. A Canadian great-grand-nephew of the headmistress at that time contacted me as he had found the item when he had been researching his ancestry. 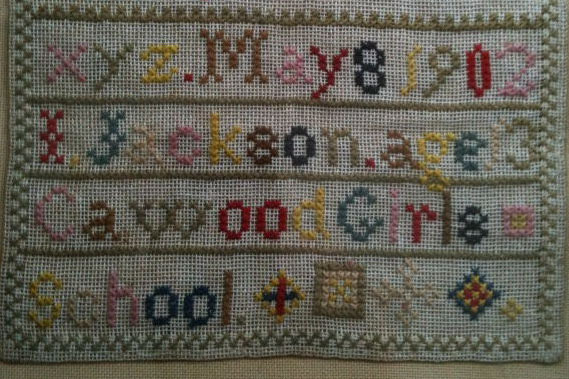 I also was contacted by someone who bought a “sampler” which turned out to have been worked by one of the pupils at the school (below). 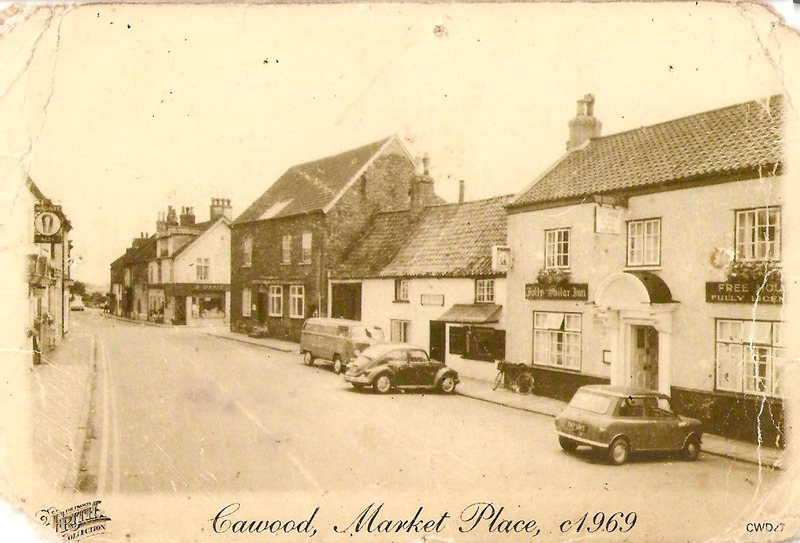 In 1923, it was decided that the education system in Cawood was such that the charity school was no longer required, so the trustees closed the school and sold the school building to Miss Sidwell, where she lived till her death in 1929 – twitching the curtains and keeping an eye on the local residents. Miss Sidwell’s trustees sold the house to Barclays Bank, who also had a weekly visit by a solicitor from York who had an office in what is now my dining room – created by a wooden folding wall. The upstairs was let out to a couple, I was informed that the lady would sit in the room downstairs (the bank), dressed in black and knitting. When the war broke out in 1939, the bank was closed, and after the war the house was sold to the sitting tenants. The house changed hands again in 1969, and after sitting empty for seven years, we purchased it in 1988. The previous owner had made a lot of changes to the building during his ownership, including the alterations to the access to the attic, etc. The Charity, incidentally, continued to provide help for local children, such as tools for apprenticeships, etc, after the school was closed.